A commemorative Freedom Plaza was created at the front walkway of Old Mt. Zion Church to honor and remember those who participated in the Movement as well as supporters of the museum project. 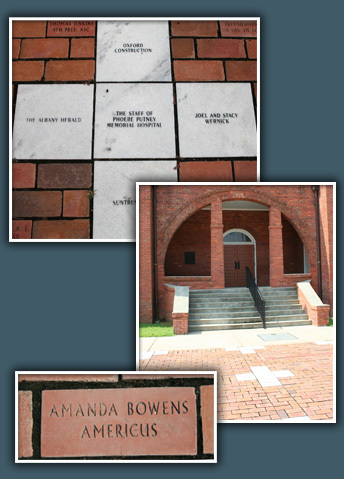 Freedom Bricks and Movement Marble plaques are available for inscriptions to commemorate a special person, organization, freedom slogan, and other treasured remembrances. A commemorative 4"x8" Freedom Brick can hold a maximum of 14 characters for each line. Each brick can feature one (1) or two (2) lines. A commemorative 12"x12" Movement Marble can hold a maximum of 18 characters on each line. Each plaque can feature up to three (3) lines. Limited quantities of marble plaques remain. All contributions are tax deductible to the extent allowed by law. The Albany Civil Rights Institute is an organization qualified to receive tax-deductible gifts under IRS code section 501(c)(3). The Albany Civil Rights Institute is classified as a public charity under IRS code section 509 (c)(3) and 170 (b)(1)(A)(vi).